There have been numerous products with a similar application, yet none of them really addressed the issue of concealing and neatly wrapping a long charging cable like the one you get with the iPhone 5, but Kickstarter product named MonkeyOh does exactly that. 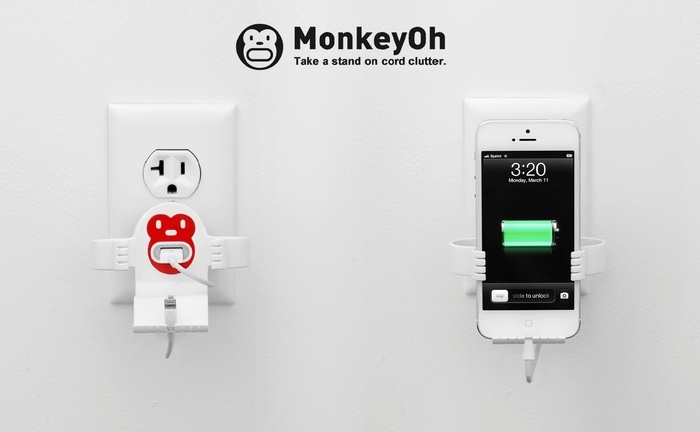 It's a charging dock designed as a cute hugging monkey that plugs directly into an electrical wall socket and securely grabs onto a device such as the iPhone 5 in either portrait or landscape orientations whilst it eliminates any cord clutter. Here’s how this clever dock works…Simply slide your Apple power adapter into MonkeyOh’s “backpack” slot, plug the USB end of the power cord into the monkey’s mouth and wrap the cord around the backpack. The clever design instantly organizes your space by getting rid of tangled cords. Finally, slide your smartphone into the flexible yet durable monkey arms for comfortable, hands-free multi-media viewing. The MonkeyOh can accommodate the smartphone in portrait or landscape orientation. By utilizing your Apple branded USB power adapter, the MonkeyOh can be offered at a reduced cost of $15 - $17. Felix, the company behind the MonkeyOh, claims that it'll also work with Samsung's Galaxy S3 and S4 devices including other similar smartphones with or without a protective case. Away from a power outlet, the MonkeyOh also doubles as a viewing stand.